I've posted here and there that we have decided on a name. I wasn't being secretive but wanted to make sure we were 100% sure before I posted and Brady isn't always the easier to understand so now I'm sharing. I have a hard time making decisions and this being a life changing one, I had to be sure. The first thing I did when we solidified his name was order brother shirts. When I saw these I knew they were perfect. If you can recall, Brady is obsessed with trash trucks and all things trash. His eyes lit up so bright when I showed it to him! 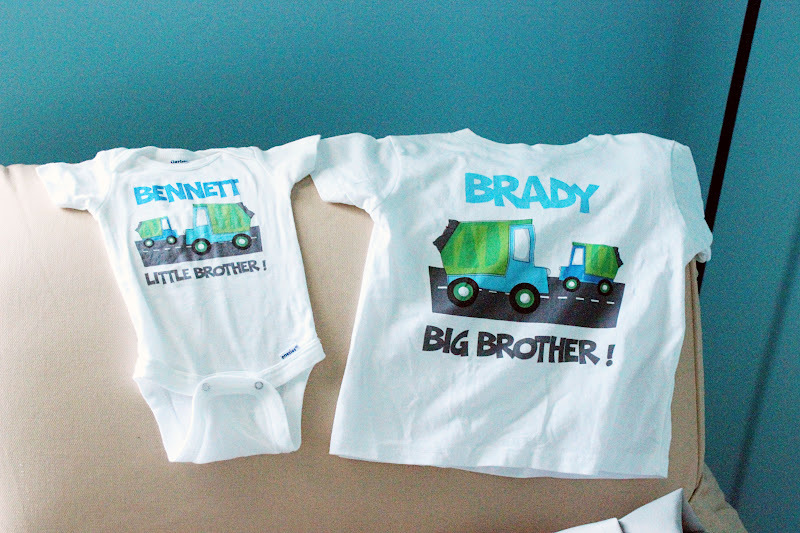 I literally tear up thinking about them wearing them or Brady walking into the hospital to meet his little bother. We were not looking for a B name by any means but once we found it, we felt it was right. Then, I looked up the meaning and I was sold. After all that we have endured the past few years and in the beginning of this pregnancy when I didn't think we'd make it this far, I think it's perfectly fitting for him. Scott will be his middle name after my Brother-in-law who passed last March. Now, we just need him to be here! LOVE the name and love the shirts, too. I thought I heard Brady say 'Bennett' in the Baby Out video but wasn't sure. So cute! Come on baby Bennett!!! Aw! Love the name and the shirts! I can't wait for you guys to meet little baby Bennett! I love the name Bennett! It was on my boys list. Are you going to call him Benny? Those shirts made me cry. For real. I'm super hormonal...and I *love* the name Bennett! I was right! I am a pro at deciphering toddler speak from being an auntie:) I love it and the matching shirts are too cute. Woo hoo! I was right on! And I ABSOLUTELY love the name!! !